Explore poetry and gratitude this Thanksgiving with this colorful Thanksgiving Acrostic Poem printable. It's a fun holiday writing activity and a wonderful way to count one's many blessings! 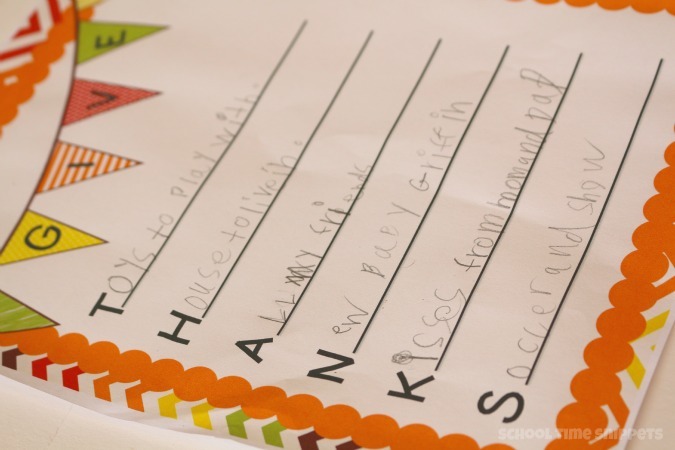 Begin a new tradition by writing down what you are thankful for this season! Using the word, Thanks" think of something that begins with each letter of the word to complete this acrostic poem. An acrostic poem is a form of poetry that uses the letters from a word to begin each line of the poem. Acrostic poems can be written about any subject. They are fun to write as they do not have to rhyme; each line can be written as a sentence, phrase, or simply use one word. To write your own acrostic poem you must first decide what you would like to write about. With Thanksgiving upon us, we chose to write an acrostic poem about gratitude using the word, THANKS. This Thanksgiving, start a tradition sharing what you and your kids are thankful for. 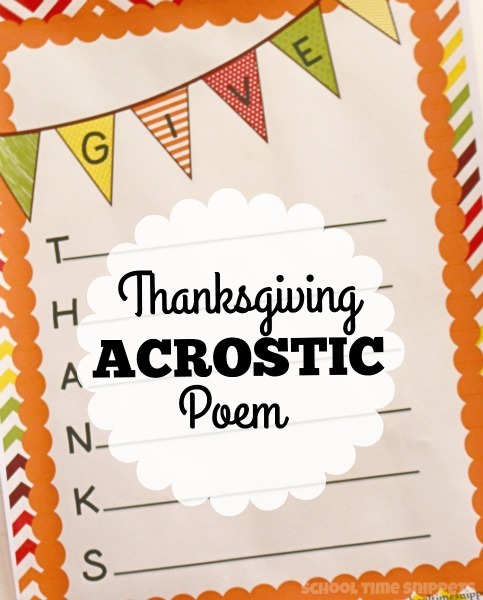 But don't just say it, write what you are grateful for in an acrostic poem! To set up our acrostic poem, I wrote THANKS vertically on a piece of paper and then my oldest and I worked on filling in the acrostic poem using those letters. Then using our list we tried to fit those things within our acrostic poem. Here's what we came up with. I did help my 8 year old-- mostly with letter K, but otherwise he filled it out all on his own. Acrostic poems are fun to write and if you get stuck trying to think of a word to use, break out the dictionary! Yes, we actually did that!! Remember, there is no right or wrong way to write an acrostic poem! This simple thanksgiving poem was a great way to reinforce all the wonderful things and people that we are thankful for in our life! It is a wonderful way to teach gratitude! Give thanks this Thanksgiving holiday by filling out an acrostic poem of your own. Print it out as you get ready for Thanksgiving dinner!